Winton Hog Brushes have been developed for use with Winton Oil Colour and can also be used with all other oils, alkyds and acrylic colours. Using the skills and knowledge of over 150 years of brush making, the Winton Hog Brush range offers excellent quality at an affordable price. Usage Oil Colour Best suited for oil. Also suitable for acrylic colour. Properties Stiff Stiff bristle for control of full-bodied colour. Fine quality. Versatile & affordable. Interlocked bristle for control & durability. Handle Long Handled Long Handled most popular for oil colour. 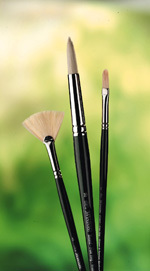 The most popular hog brush shape produces the bold, defined marks expected from a flat brush. The shorter bristle length of this style gives greater control of thicker colour or when using large amounts of colour. A long flat head. Good for blending, glazing or covering large areas. This brush is made to the same specifications as the Short Flat/ Bright but with a longer bristle length for greater spring and freer marks. This brush style is often used with more fluid colour. For fine detail, lines & glazes. The Round is the oldest brush shape, in smaller sizes they are indispensable for detail lines and highlights. Many artists prefer the linear mark of the larger rounds compared to the flat mark of Short Flats. Flat with oval tip. Creates a broad mark with a soft edge. Always clean brushes immediately after use, see below. Never leave brushes resting on their bristles. Shape up bristles with your fingers after cleaning. If you are storing Winton Hog Brushes for any length of time, make sure they are clean and perfectly dry and keep them in a box with a tight fitting lid to avoid moth damage. If the brushes are not absolutely dry they may develop mildew. Paint should never be allowed to dry on any brush. Should this happen household paint stripper could be used to soften it, however, the brush is unlikely to return to its original shape afterwards. Wipe excess colour from the brush using a rag or Winsor & Newton Artwipes. Rinse remaining colour from brush using Artists' White Spirit or Sansodor for oils and alkyds and warm running water for acrylics. are removed. Shape up the brush and rest it bristles uppermost in a pot or jar, to dry.